A festive mix of traditional carols, our own arrangements of holiday pop favorites, gorgeous 20th century classical pieces and original songs both touching and amusing. 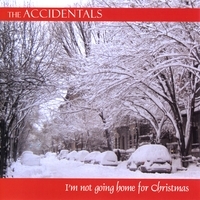 The Accidentals' first public performance was at New York City's renowned Bottom Line, singing Christmas music to benefit a homeless shelter. Christmas is still our favorite time of year- we've sung everywhere from Radio City Music Hall to clubs and cabarets to our perennial shows downtown at the World Financial Center. Our CD, "I'm Not Going Home For Christmas", shows our eclectic taste- from our own arrangements of carols and pop standards to classical music from Bach and Handel to Poulenc and Britten, as well as our original songs. Our fans tell us they love to play our CD while they decorate their tree! Peace, Love and Joy to all.